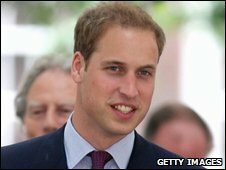 Prince William has been made an honorary barrister - but promised not to practise, "except for the odd speeding ticket". In a ceremony at London's Middle Temple he was also called to the Bench, the ancient Inns of Court's governing body. His "proud grandmother", the Queen, who could not attend because of another engagement, sent her good wishes. In accordance with tradition, William, 27, described his hobbies and passions in a speech to nearly 300 guests. "I play football, rugby and water polo, not very well, but particularly pride myself in being a quite magnificent armchair centre-back at football and flanker at rugby... and now you have made me a barrister - I promise not to practise, except for the odd speeding ticket," the trainee RAF helicopter pilot said on Monday. The second-in-line to the throne is the sixth member of the Royal Family to be made a Royal Bencher, following in the footsteps of the Queen Mother, and his mother Diana, Princess of Wales.